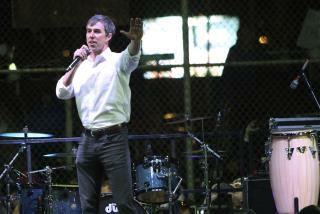 (Newser) – President Trump and Beto O'Rourke held dueling rallies across the street from each other—and across the Rio Grande from Mexico—in El Paso on Monday night. Both men addressed the border wall issue, with Trump, at his first rally of the year, speaking under signs that read "Finish the wall," the El Paso Times reports. The president appeared unaware that lawmakers in DC had reached a deal that included border wall funding well below what he had asked for, reports the AP. "I had a choice. I could've stayed out there and listened, or I could have come out to the people of El Paso, and Texas, I chose you," Trump said. "So we probably have some good news. But who knows?" He added: "We're building the wall anyway." O'Rourke, meanwhile, spoke at a protest rally that followed a march with dozens of local groups, the Guardian reports. Looking more and more like Beto's crowd could've been twice the size of Cheeto's. Beto beat Cheeto. Neato. And Beto's crowd represented the actual demographic of El Paso, while Cheeto's largely represented his usual slugs -- dumb and white. Oh, so white. And fat. Lots and lots of fat people. Trumpy is 100% GOP !! The GOP Nominated this trumpy Idiot, now control "it", please ! !